A round-up of sports and outdoors camps in the East Bay: soccer, basketball, baseball, gymnastics, tennis, and more! School closed for a staff development day? 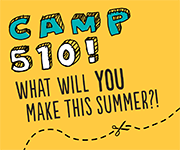 Rally your fellow school parents to coordinate an impromptu mini-day camp with friends. It is that time of the year again: Berkeley & Oakland Winter Break Camps fill in where you leave off. Winter Camps for East Bay kids. Listings of camps that will provide childcare and fun during Veteran’s Day & Thanksgiving break for kids in the urban East Bay area. Here are a few resources whose email lists you might want to get on so that you can arrange childcare now for fall school holidays.